You have provided only the pro argument for adopting Messara’s recommendations. Where is the con argument to back your assumptions…or is it just a gut …’feeling’? So this govt is wanting to hand over all TAB activities to an Aussie gambling company? You can’t make this stuff up! At the same time Shane Jones is attacking Australian owned banks. Closing the regional banks is a disgrace and shows Aussie contempt, despite the fact they have low patronage and are losing money. Closing regional race tracks is necessary because they have low patronage and are losing money, so you’d be stupid to keep them open. attacking them for gouging huge profits out of NZ and reducing services to provincial NZ. Yet just below you want to hock off the TAB to the Aussies & close many provincial tracks because that will create more money! do you even know who owns the tracks? They can keep them open…if they can get horses to race there and provide all that entails…if the monopoly is ended. its a logical move.Australian racing is way more attractive to NZ punters and they are the lifeblood of…racing. Pools in Oz…e.g Melb Quaddie $1mil plus every Sat as against $50k NZ pools are an example. Adopting Aussie tax treatments of revenue will also provide extra funds. The TAB has a virtual monopoly and has the usual over paid ,underperforming malaise common in such entities. 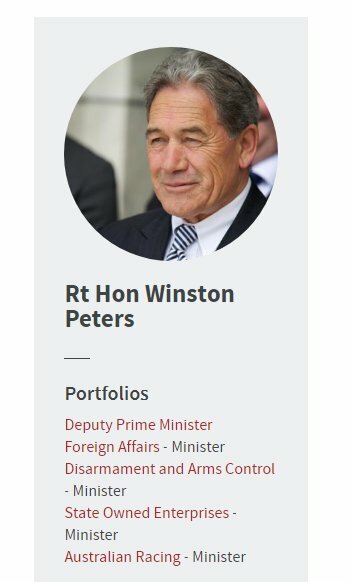 NZH October 2017 “Peters said the sell off of New Zealand interests to overseas buyers was the “continuing story of this country’s decline since the 14th of July, 1984”. I stated facts…you can not apply that statement to every single economic activity in NZ. Peters means property and resources. Most of the public care little about the racing industry. Peters means whatever you want him to mean Blazer. What do you really know about NZ Racing?…very little by your comments. You mean to say NZ Racing is the only thing you know something about? no thats not what I’m…saying. Short man speaks with forked tongue, Pants. How would Winston really know the value of community if he never lives in one. Why have 20 economic race track failures? When you can have 4 economically thriving ones. This looks like the real PR 1080 drop … so I went in search of the pre-bait ‘feeder’ PR drop … NZHeraldo 22 May 2018 might be it …? “New Zealand’s racing industry was responsible for generating more than $1.6 billion in value-added contribution to the New Zealand economy in the 2016-17 season … [and] was directly responsible for sustaining 14,398 full-time equivalent jobs across the nation. This total represents the employment sustained within the industry, as well as … in supply industries who meet the demand created by racing industry activity … In total, there are more than 58,100 individuals who participate in the New Zealand racing industry as employees, participants or volunteers. Many of these people enjoy gainful employment of their specific skillset where they may find limited opportunities otherwise – particularly in the breeding and training/racing related disciplines. Furthermore, many participants hold more than one role within the industry. In 2016-17, breeders in the New Zealand racing industry spent more than $380 million on the production of racing stock … More than 614,600 attendances were recorded at thoroughbred, harness and greyhound race meetings in New Zealand. If it’s good for provincial bank branches its gotta be good for racing … right? people in racing know a big shake up is needed….just not in their…town. The con-verse side of neoliberalism is, of course, the growth of a compensational* Charitocracy (to attempt to maintain axed or under-funded government services, and to create compensatory employment). Racing is clearly a major contributor of funding to The Charitocracy … NZ’s Social Services Funding Popularity Contest. Secondly, some of the ancillary economic ‘benefits’ of racing should not be discounted. It’s tie-up with gambling makes it arguably the original ‘economic addiction’? What ISN’T self-explanatory about this statement [in the Media Release that everyone including RNZ is publishing]? The real question is: Why don’t they do this for every industry they eviscerate? Plenty of people with specialist skills in other industries had to retrain and change industries. Why not racing industry people? I can tell you that the influence in TB racing at least is weilded by the big breeders . The writer of the report owns one of Australasias biggest and most successful…he actually used to be a stockbroker. Racing in the provinces is not all about racing,Its about community events and gatherings ,in declining rural communitys.If these meetings are making money,especially if they are annual events,why close them?They should not be scapegoats for clubs that do not make profits. Don’t kick the rural communitys in the guts,by cutting some of the few community events,in rural areas,when in reality,they are a large percentage of the productive sector in New Zealands economy,propping up it’s urban counterparts. racing struggles to be viable though. You need owners with bottomless pockets…the stakes are way less than they were years ago,and costs are increasing and the new generations are not interested. Track attendances are very modest compared to the halcyon days of the 50’s and 60’s.